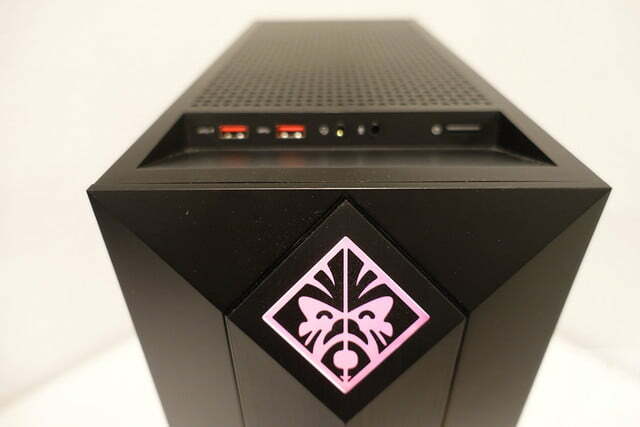 The HP Omen Obelisk has the power serious gamers need at a surprisingly affordable price. 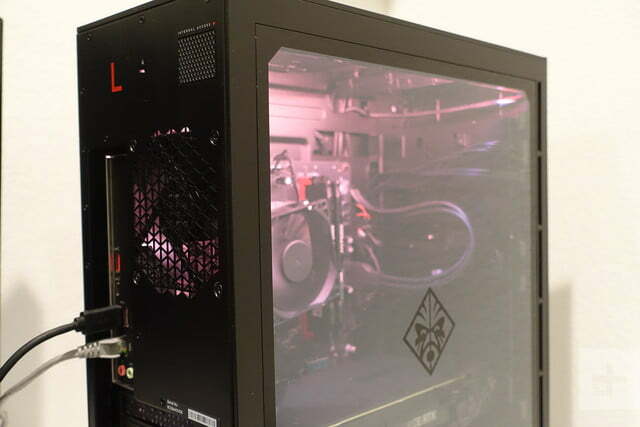 Prebuilt PCs were once the subject of ridicule among enthusiast gamers. 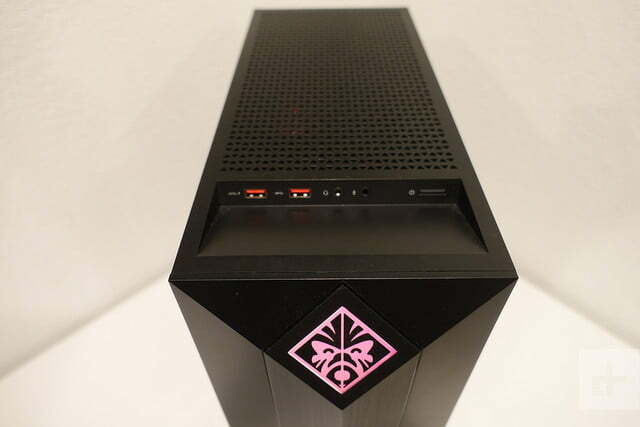 HP hopes to change popular opinion and the conversation in gaming circles with its newest Omen Obelisk. This gaming PC targets more serious gamers with features like Intel’s Core i7 or AMD Ryzen processors, fast HyperX RAM, optional Intel Optane memory, and Nvidia’s latest GeForce RTX 2080 graphics. And the best part is that this compact gaming desktop tower still comes with enough internal space to support future upgrades. The Omen Obelisk has a modest sub-$900 starting price, but you won’t be impressed with those specs. Our upgraded $1,999 review unit comes is the one you want with its sleek case, large tempered glass window, and high-end components. 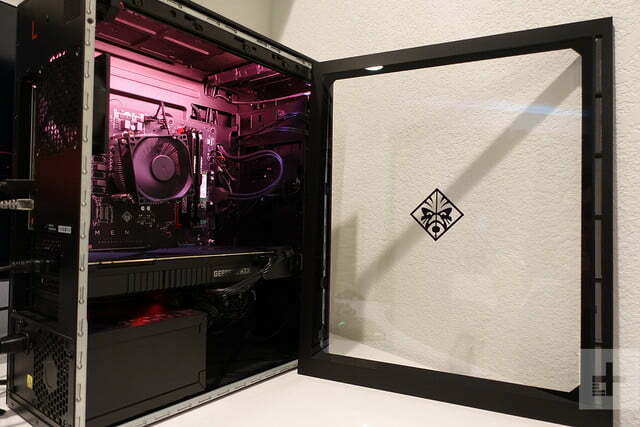 You might be surprised how much gaming goodness HP managed to pack into this package. Though it likely won’t appeal to gamers seeking a flashier system, the Obelisk’s more demure aesthetics make it fit more easily into a home office setup. With its all-black metal construction, sleek tempered glass side window, and subtle LED lighting, HP is clearly targeting home users who may need this desktop to serve dual purposes for work and play. 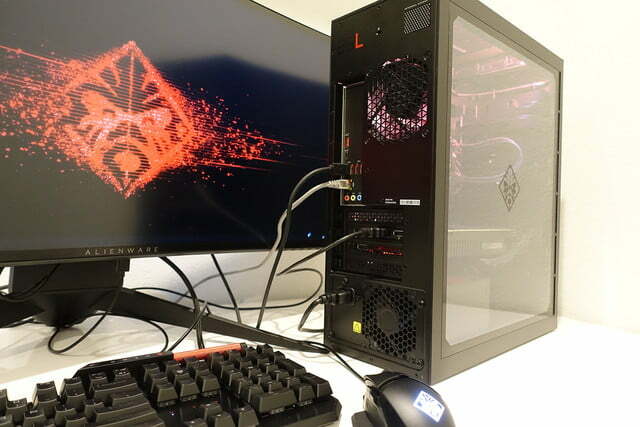 Unless you’re able to spot the glowing LED-lit Omen logo at the top of the pyramidal-shaped Obelisk in the front or notice the glowing backlight through the glass panel, the Omen Obelisk can easily pass as a standard consumer desktop. HP doesn’t downplay the Obelisk’s Omen gaming heritage though. It’s just a stylish tower that foregoes the garish flourishes that are traditionally linked to gaming PCs. With a name like Obelisk, you’d expect HP’s desktop to tower on your desk. Fortunately, that’s not the case, as the Omen Obelisk is a compact desktop even though it comes in a familiar tower form factor. Our review unit supports a microATX Edoras motherboard and full-size graphics card, helping to keep the overall footprint to a minimum on your desk. You still have access to an array of ports and plenty of space inside the case for future upgrades. Despite a showy, un-tinted tempered glass window, there isn’t much visual interest inside. 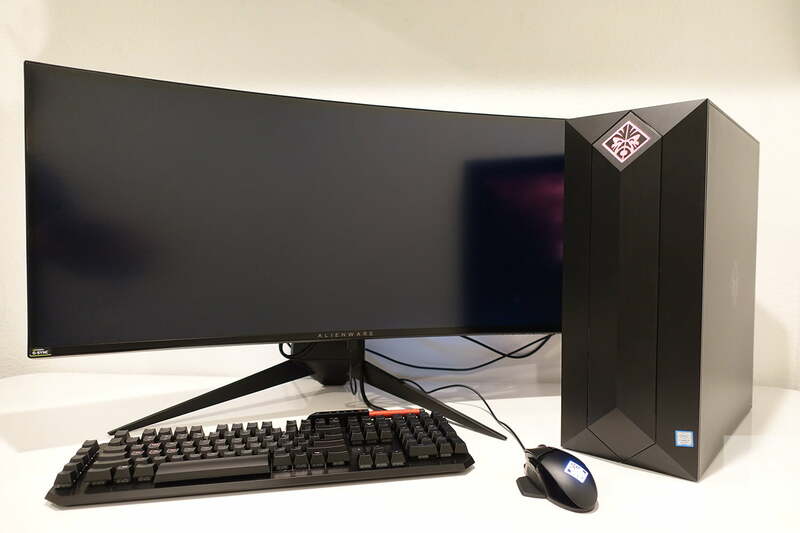 The Obelisk’s 6.5 x 14.1 x 17-inch (width x length x height) dimensions is comparable in size to the Asus ROG Strix GL12CX gaming desktop, making both towers fairly compact for the RTX graphics power that’s inside. The ROG benefits, however, from a larger ATX-sized motherboard and a newer processor but comes with a significantly more expensive $3,200 price tag. 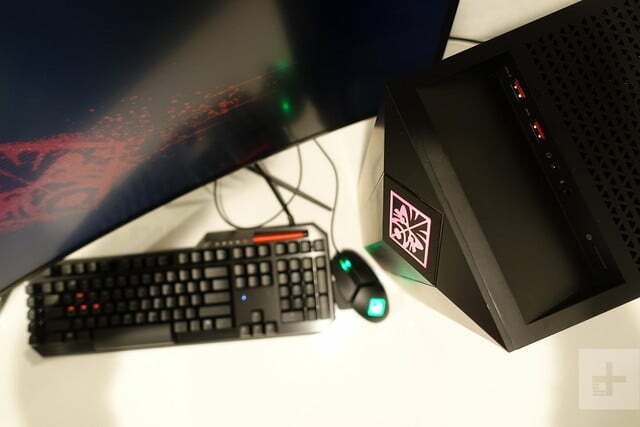 But if size is a concern, boutique gaming firm Origin PC’s recently refreshed custom-built Neuron ships with a microATX motherboard with a 9th-Gen Intel Core i9 and beefier RTX 2080 Ti graphics. The Lenovo Legion C730 is smaller still, but that cooler-inspired PC comes underpowered with last generation’s GTX graphics. Despite its un-tinted see-through side tempered glass window, there really isn’t much visual interest inside. Like competing gaming systems, there’s configurable RGB lighting, and the handy cable management system keeps things organized and tidy. But you won’t find a fancy RTX graphics cards with glowing logo or a fancy radiator. Where the glass panel design really comes into play is on the upgraded Omen Obelisk configuration that was announced at CES 2019. This newer model tops out with a newer Intel Core i9 processor and more powerful RTX 2080 Ti graphics. The eye-catching elements from this model include the radiator and pipes from the liquid cooling system, which should help provide more visual interest when you’re looking through the glass. HP is clearly targeting people who may need this desktop to serve dual purposes for work and play. For DIYers who want more control of their desktops, the EMI-coated glass panel can be accessed without tools. HP claims that the clear EMI coating helps to prevent any radio or magnetic interference. By pulling a latch on the rear of the tower, the side panel can be quickly removed, giving access to all the internal components. Inside, you’ll find access to two RAM sockets, two M.2 sockets, full-height graphics card, fan, hard drive, and a 500-watt power supply unit (PSU). Though the low watt rating on the PSU may seem underwhelming given the RTX graphics card, we encountered zero issues with this configuration. 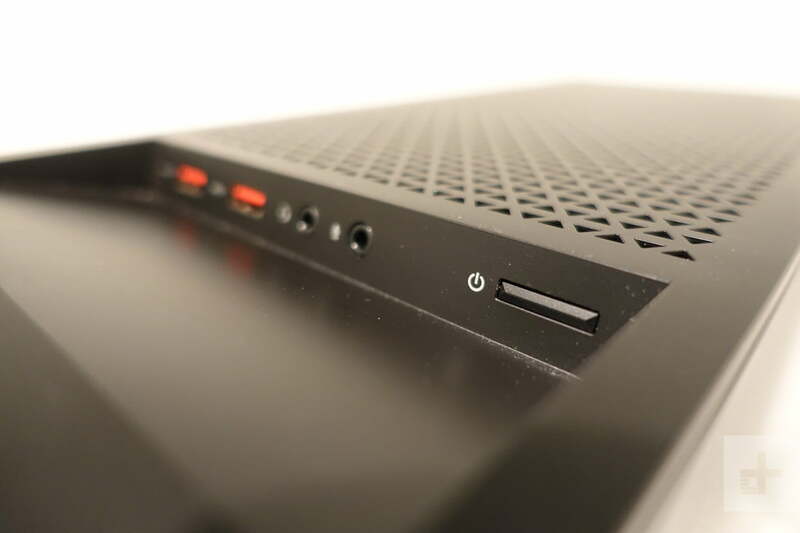 Although our build doesn’t come with much in terms of active cooling, the Obelisk did manage to keep temperatures in check with strategically placed vents along the rear, sides, and top. 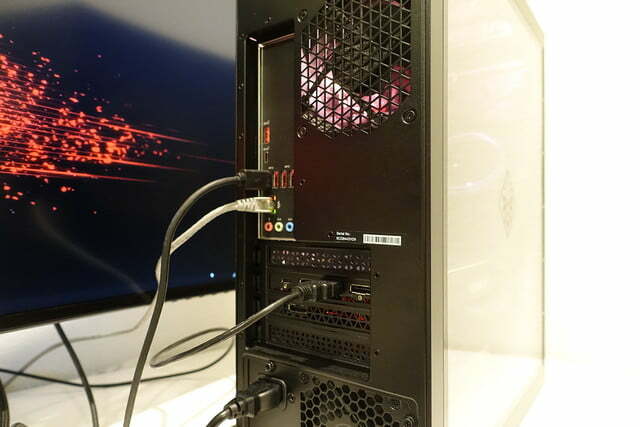 The bottom-mounted PSU also helps with heat dissipation, and two non-LED-lit fans help with air circulation. In use, the fans sounded a bit louder than some competing premium gaming PCs that we’ve tested in the past. There’s also a dust filter, which comes in handy to keep things looking clean when you have a large see-through glass panel. The tower supports plenty of room for expansion, should you need to swap in a beefier PSU or decide to upgrade to a GeForce RTX 2080 Ti card in the future. RAM and storage are both quick upgrades. The Omen Obelisk also ships with HP’s USB keyboard and mouse, but serious gamers will either bring their own peripherals or upgrade the stock accessories. The Omen Obelisk includes two arrays of ports to help you connect your monitor, keyboard, mouse, and other peripherals. Mainstays, like the power cable, display output, and speaker connection, can be plugged into the rear. Five USB 3.1 ports, a single USB-C port, HDMI, and three DisplayPort connections, Ethernet jack, and audio ports line the back of the unit. On this generation of the Omen Obelisk, HP redesigned the top ports with a front-facing design for easier access. On the prior generation, the Obelisk was designed with rear-facing ports, making for a sleeker and cleaner design at the expense of port accessibility. Up top, you’ll find two USB 3.1 ports, headphone jack, microphone jack, and the power button. In a move to keep costs down, and likely in a rush to release the Obelisk sooner to gamers, HP opted not to wait for Intel’s newer 9th-Generation processors. 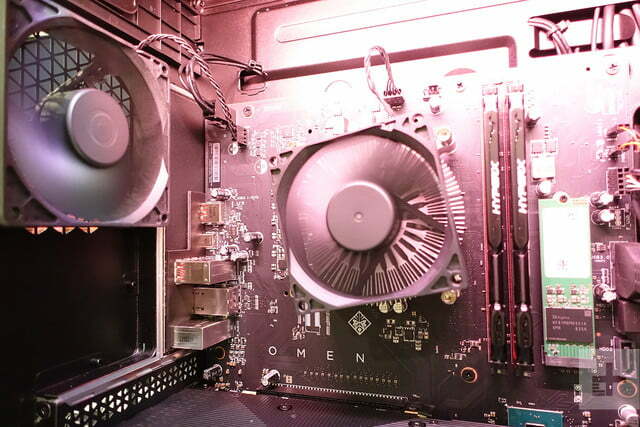 As a result, the Omen Obelisk units that shipped in late-2018 came with 8th-Generation Intel processors. Our review system came configured with an Intel Coffee Lake Core i7-8700 CPU with six cores and 12 threads. The slower performance of Intel’s previous generation processor is apparent, however, when running processor benchmarks. The Omen Obelisk posted lower single- and multi-core scores than competing systems that use 9th-Generation Intel Core i9-9900K processors, like the Origin Chronos, Digital Storm Aventum X, and Asus ROG Strix GL12CX. 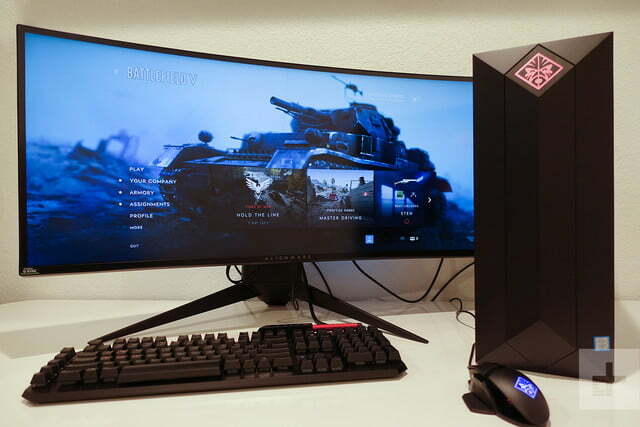 Compared to the Alienware Area-51 R5’s Intel Core i9-7980XE processor, the Obelisk posted mixed results, scoring 700 points higher on the single-core test and more than 3,000 points lower on the multi-core test. When we used Handbrake to encode a sample 4K movie, the test performed 38 percent faster on the ROG than the Omen Obelisk. And even though our unit comes with a 512GB M.2-format solid-state drive made by SK Hynix, the drive was on the slower side, with 664 Mb/s read and 448 Mb/s write speeds. These speeds are slower than competing Samsung, Toshiba, and Western Digital Drives on other units we’ve reviewed, like the Aventum X, Microsoft Surface Studio 2, and Huawei MateBook 13. It’s even slower than the Lenovo Legion C730, which comes with a smaller 256GB SK Hynix SSD. There’s also a 1TB hard drive on this system, and users who need more storage capacity can add a third drive. Both hard drives are easily accessible in the hard drive bays, and swapping out the M.2 SSD is an easy task, only requiring unscrewing a single Phillips-head screw. Thankfully, despite somewhat slower processing speeds relative to contemporary rivals, the Obelisk remains competitive in the graphics department, thanks to its Nvidia GeForce RTX 2080 graphics. Still, despite sharing a similar graphics card as the Asus ROG Strix GL12CX, the Omen Obelisk performed slightly worse across 3DMark Time Spy, Sky Diver, and Fire Strike tests. Both units’ scores were similarly lower than the Origin Chronos, which is to be expected given that the Chronos ships with an RTX 2080 Ti card. With 3DMark’s new Port Royale benchmark, which measures ray tracing, the Obelisk scored 5,598 points with an average of 25.92 FPS (frames per second). 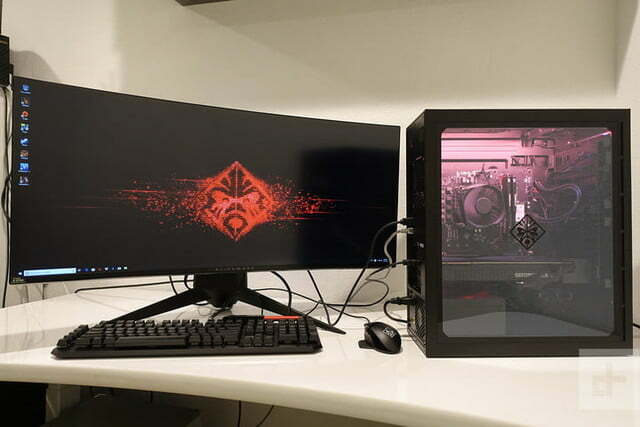 In our gaming tests, the Omen Obelisk again delivered similar performance levels as other systems with Nvidia’s RTX 2080 graphics. In general, marks across the board in titles like Civilization VI, Deus Ex: Mankind Divided, Battlefield I, and Rocket League were slightly lower on the Obelisk than the Origin Chronos. In Battlefield I, Civilization VI, and Deus Ex: Mankind Divided, the Obelisk delivered well over 60 FPS across all game settings, even in 4K resolution. In Deus Ex: Mankind Divided at 4K in Ultra mode, there was a noticeable dip in performance, but the Obelisk performed 10 FPS better than the Asus ROG Strix GL12CX’s 39 FPS mark despite both systems sharing similar graphics cards. This shows that even with an aging 8th-gen Intel processor, the Obelisk was still able to keep up with competitors running newer 9th-gen silicon. Given the consistently strong performance of the Obelisk, gamers may not notice much of a performance gap, even with an older processor. In general, we found that the RTX series graphics delivered more consistent results across 1080, 1440p, and 4K resolutions than the older GTX series, which showed a slowdown in framerates at higher resolutions. With the real-time ray-tracing enabled on Battlefield V, we noticed that the game appeared more realistic, and we appreciated the added level of details. The feature, however, does tax the system at higher resolutions, and there’s a noticeable dip in performance when ray-tracing is cranked to “ultra” in 4K resolution. With ray-tracing off and HDR enabled, the game played on average between 56 to 59 FPS in 1080p, 1440p, and 4K resolutions at approximately 60Hz. When ray-tracing is enabled, framerates remained consistent at lower 1080p and 2K resolutions, but in 4K, performance in the “Nordlys” mission dropped to just 32 FPS. HP offers a standard one-year off-site warranty covering parts, labor, and shipping fees to send the unit to a repair center. Gamers who want longer peace of mind can choose an upgraded two-year warranty for $239 or a two-year plan with accidental damage protection for $279. The latter covers unexpected events, like water spills or even drops, which can come in handy if you find yourself frequently toting the Obelisk to LAN parties. HP’s base one-year warranty falls in line with what mainstream brands, like Dell’s Alienware and Lenovo’s Legion offers, but these rivals offer longer premium packages that can extend the protection of your system for up to five years. More expensive build-to-order systems from boutique brands like Origin PC and Digital Storm come with a base three-year limited warranty. HP made some sacrifices to rush the Omen Obelisk out at the end of 2018, and this means that the unit doesn’t top out with the best CPU or GPU at the best configuration. Still, at a sub-$2,000 price point, the Obelisk’s 8th-Gen Intel – rather than the newer 9th-Gen silicon – processor and RTX 2080 graphics does a commendable job at handling framerates in game play. In our benchmarks, we found that HP’s decision to go with Intel’s last generation processor didn’t have much of an impact on gaming performance. 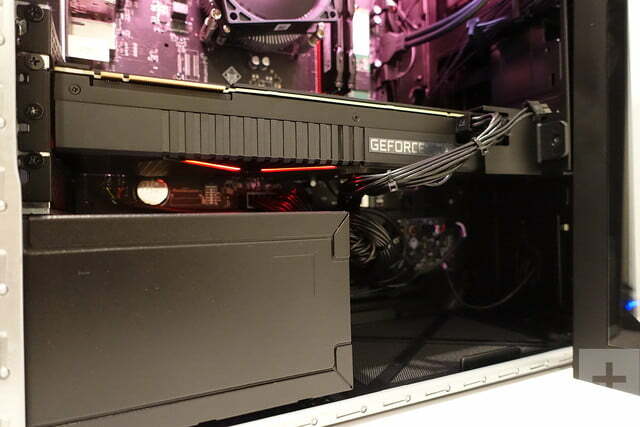 And unless you’re pushing the gaming envelope with ray-tracing titles at the highest game settings at 4K resolutions, going with the Obelisk’s RTX 2080 graphics, instead of the flagship RTX 2080 Ti will likely save you a bit of cash, as performance with ray-tracing enabled generally only dropped at resolutions greater than 1440p. If you’re okay with Intel’s last generation processors, HP’s Omen Obelisk is very competitively priced for its specifications. Asus’ competing ROG Strix, for example, costs approximately $1,200 more than the Obelisk at $3,299. At that price, you’re getting a newer 9th-Generation Intel Core i7-9700 processor. Dell’s Alienware Area-51 desktop costs the same price as the ROG Strix, but you’re getting an eight-core Intel Core i7-7820X processor, 16GB RAM, and 128GB M.2 solid-state drive coupled with a 1TB hard drive. Boutique PC manufacturer Origin PC’s Chronos desktop also comes in a similarly compact package. 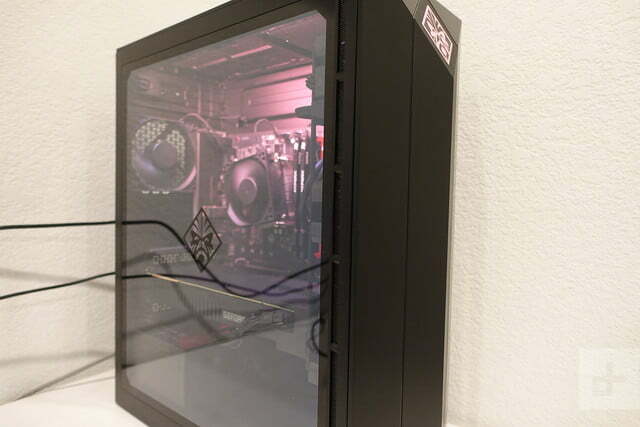 When configured with an Intel Core i7-9700K processor and an RTX 2080 graphics card, the Origin starts at $2,432, which is a $400 premium over the Obelisk. Origin offers far more customization options if you like to trick out your rig, but the Chronos doesn’t come with HP’s single-pane window design. If you’re a more serious gamer, you’ll want to wait for the 2019 version of the Omen Obelisk that HP announced at CES. 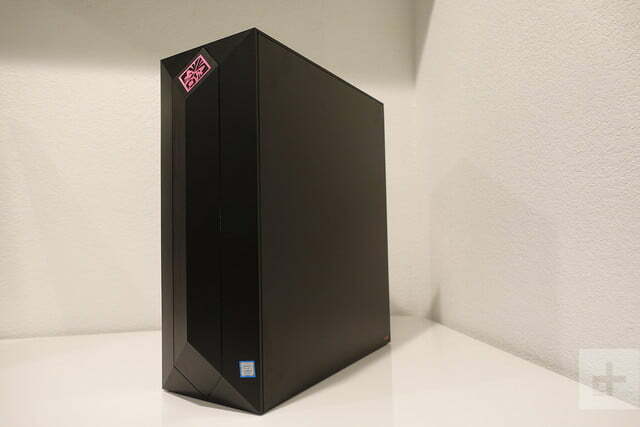 The 2019 Obelisk maintains the same aesthetics and design as our review unit, but the improved configuration maxes out with newer Intel Core i9 processor, better RTX 2080 Ti graphics, and a radiator for liquid cooling. This updated model is expected to deliver more power for computational tasks and improved gaming performance. It’s slated to arrive in March starting at $2,249, so pricing on the 8th-gen Intel configuration could drop at that time. Regardless of which configuration you settle on, the HP Omen Obelisk will satisfy your gaming needs for years to come. All the internal components are upgradeable, and if you opt for an RTX series graphics card, you’re buying a future-proof PC. The challenge for most gamers who purchase this and other RTX-equipped system is waiting for developers to add support for ray tracing into their titles, and that process can take a while. Yes. If you don’t have the patience to source your own parts to build your own PC, HP’s Omen Obelisk is a great pre-built alternative that’s competitively priced and well equipped to deliver the performance most gamers need. Though it’s a gaming tower that’s targeted at mainstream gamers, it’s got enough features – ease of upgrade, RTX power, and a modern design – that makes this desktop appealing to the enthusiast.